Energy consumption in Longyearbyen is high above the average in mainland Norway. Heating is provided in Longyearbyen by long-distance heating from the coal power plant, and the locals are generous when using this precious resource. The reason is not only the cold climate, which in fact is not even that much colder in the maritime climate of Spitsbergen compared to continental parts of Scandinavia. Bad insulation of buildings is amongst the main reasons. Longyearbyen was a mining settlement for much of its history and the buildings were originally intended for use during shorter periods only rather than by a more or less permanent local population. This is reflected by cheap and simple construction methods where insulation was obviously not a priority. Many buildings in Longyearbyen date back to years before 1970, and Norwegian building regulations did not come into force in Spitsbergen before 2012. Building quality may be changing quite quickly now, as many older houses have to be abandoned due to avalanche risks and a lot of houses will be built in the years to come. Additionally, the energy consumption and heating habits of many locals are not exactly characterized by ambitious energy-saving. Some are said to open the window rather than turn the heating down. Thermostats are the exception rather than the rule. Heating costs are based on living space rather than actual consumption. And many live in flats provided by their employers, who also covers the running costs. 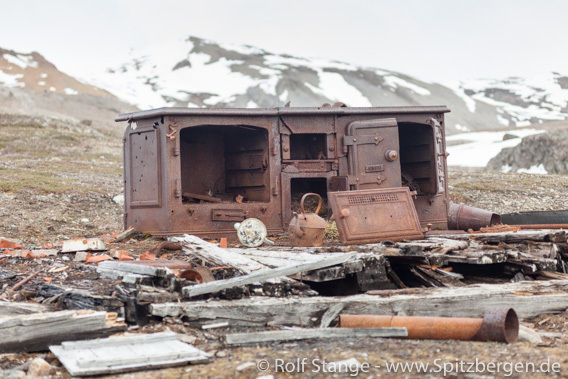 Heating in Spitsbergen: large oven, poor insulation. Many inhabitants consider Longyearbyen and their own life and habits as environmentally friendly, but reality may be different, looking at electricity use, heating and traffic habits. If people in Longyearbyen were heating as people in mainland Norway do, energy consumption related to heating would drop by about 40 %. In winter, the potential to save energy is even higher, as reported in an article in Teknisk Ukeblad. Also regarding electricity, matching local habits to mainland manners would reduce the consumption quickly by 15 %. Passive houses would increase the reduction to an impressive 25 %. The next years may bring improvement due to the high current construction activities. Technical possibilities to improve insulation of existing houses are also work in progress. So is the primary energy production in Longyearbyen. The only thing that is clear is that the current coal power plant will not be the long-term solution, but nobody knows what is to come then. Many options have been discussed over many years, including a new coal power plant, gas, possibly combined with renewable energy (wind? Solar power? ..?) and even a cable to the mainland. A decision has not yet been made.